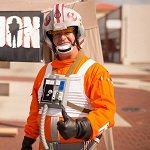 Rebel Legion :: View topic - New Recruit! Posted: Fri Jan 26, 2018 5:11 am Post subject: New Recruit! I just want to introduce myself- I am currently working on my first costume, a classic x-wing pilot. I'm waiting on my helmet and chest box from DarthHair, and in the meantime I'm working on modding my coveralls and creating the flak vest/harness/belt/flares etc. I'm really looking forward to becoming an approved member and meeting new people! I signed up for the Ra Kura Recruits facebook page, but I haven't been accepted there yet. I'm in West Florida for the purposes of this group. "The belonging you seek is not behind you- it is ahead." Welcome to the group! Make yourself at home and let me know if there's anything I can do to help you settle in! I am excited to see the progress of your costume, and we have LOTS of awesome pilots here in Ra Kura if you need any help or advice! You are already on the FB Recruits page (I think you should have been accepted?) so that's a great place to ask questions and show your progress! Boots are usually what vexes people the most. If you need advice on what works, feel free to ask. We're here to help!